Items dont have to be bed quilts... perhaps you have other quilted, dyed or embellished crafty loveliness. . . . toys, pincushions, embroidery rolls, journal covers, Xmas decorations, table runners, bags and cushions. We all enjoy the sharing of patchwork and quilting creativity. We welcome Guild members and Non-Guild friends and quilters to Friday Showcase. It is a juried exhibition of Art Quilts created by members from this national organisation. Art Quilt Australia is presented by Ozquilt Network Inc, Australia's organisation for art quilters, in conjunction with Craft ACT. In 2013 Art Quilt Australia will be a curated exhibition of innovative, new contemporary art quilts to celebrate the centenary of the naming of the nation’s capital city as Canberra. Works will be selected that are inspired by, or reflect on ideas of people, place and nation. 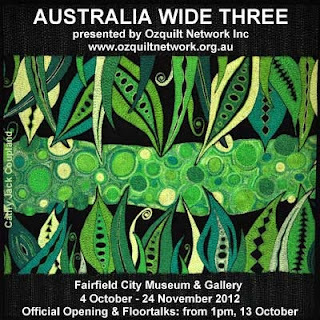 With the definition of a quilt as "a stitched layered textile", the exhibition is open to all artists across Australia. It will be curated by Valerie Kirk, Head of Textiles at the ANU School of Art and be held at Craft ACT Design Gallery in Canberra from 31 October to 14 December 2013. Large quilts are preferred but must not measure more than 2 metres in either direction. The closing date for entries is 19 July 2013. The membership information on the website of The Quilters' Guild of NSW Inc reveals that a rejoining fee of $15 will be incurred for all members whose membership lapses after 30th September. Please ensure that your membership is current, with fees paid to cover the financial year 1st July to 30th June, so that all membership entitlements can continue. 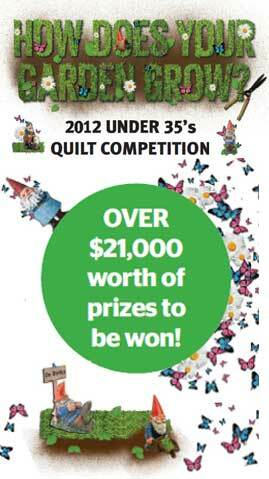 A 'healthy' number of more than 70 quilts were received for The Under 35's Quilt competition conceived by The Quilters' Guild of NSW Inc. as part of their 30th Birthday celebration activities. These entries will be exhibited this weekend, and all are invited to view this display of creative works from our younger generation of quilters. Awards Ceremony: Saturday, 22nd September at 11am. Parking: Street parking is available around Newington College. This is an exhibition to delight both the lads and lassies of Forster in the Great Lakes area of regional NSW. There will be a display of Quilts, Challenge Entries and Woodwork items, along with demonstrations in both craft disciplines and the sale of handmade items. Along with all this crafty excitement, morning and afternoon teas and a lunchtime sausage sizzle should be enough to drag the 'footy tragics' from Grand Final TV coverage! UPDATE : THIS ACTIVITY HAS BEEN CANCELLED. Apologies to all guild members. The next Sewing in the Office event for Community Quilts is on Monday 24th September 2012 from 10-30 am - 2pm. As always, there is laughter and quilting wisdoms to share at this monthly gathering of quilters, who willingly commit their time to creating the quilts that bring joy to many needy children. Please bring your own sewing notions and a spot of lunch for this event. The entries for the "How Does Your Garden Grow" Quilt Competition for Under 35's will be on display at Newington College in two weeks. Be sure not to miss this exhibition which features the quilt makers of the future. Is your daytime favourite sewing chair no where near the night-time one? Do you live in a multi story dwelling? Do you have several projects on the go and the one you want is never where you want it? Keep projects separate on a "$2 Shop" plastic tray, kitted out with the necessities for that project. Cart the tray around to your special spots. Well, how about contributing your simple but effective "Pearls of Wisdom" to the booklet that the Committee is hoping to collate during this "Pearl" 30th Year Anniversary? Please contact the office of The Quilters' Guild of NSW Inc. for inclusion of your "Pearls of Wisdom"
Unfortunately the "booklet" is not even a pamphlet at this stage! Pristine waterfalls and majestic rain-forested National Parks enthral visitors to this area of northern NSW, and after the bushwalking, a stroll through the historic and quaint town of Dorrigo will enable an encounter with delightful cafes and boutiques. Misty Mountain Getaway offers a yearly quilt "Challenge"for any quilter to enter. This year the Challenge title is "Where the Mountains Reach the Sky"
The talk to be given by Dr Annette Gero at the Penrith City Library on Tuesday 11th Sept during NSW History Week has received unprecedented support. Whilst there will be no more bookings taken, there are plans to perhaps repeat this presentation at a later date. Dedicated quilters from the southern regions of NSW, from Kiama in the north to Eden on the far South Coast as well as those inland from Yass to Jindabyne, are gathering to stage their 11th Biennial Quilt Exhibition. As always there will be a Quilt Raffle and this year the proceeds will contribute to a Charity important to all who live and visit these areas : the Snowy Hydro South Care Helicopter Service. A diverse range of quilts will be on display, and participants can also support the many craft stalls and selected retailers at this exhibition. Lois Cook presents Friday Showcase at the Guild office at 10am on Friday, 7 September 2012. Lois was awarded Life Membership at the General Meeting in October 2011, having demonstrated outstanding commitment and dedication to the Guild at all levels. Detail.... "For Nathan" Lois Cook. 'Best of Show' 2011 Eastwood Patchwork Quilters. Handquilted. Known for her beautiful quilts, hand piecing and hand quilting, she has deservedly won many awards. Come and hear Lois's quilting story and be privileged to view her wonderful quilts up close. The entry fee is $5 entry for members and $10 for non members.